With a nice little introduction by film Director Roger Corman, who has tackled several Poe stories during his career, this great graphic adaptation of some of Edgar Allan Poe’s most well known short stories helped while away some time as I await the release of the John Cusack Poe vehicle ‘The Raven’ to hit the DVD stores (as I sadly missed it’s brief cinematic release). Although this collection has been around for a few years, and I’m late to the party on this one, I’m sure it managed to achieve what was certainly on of its aims – to bring the work of Poe to an audience that would haven been unlikely to have read his original work, in the same way that the Manga Shakespeare titles (also from Self Made Hero) work for so many younger readers. 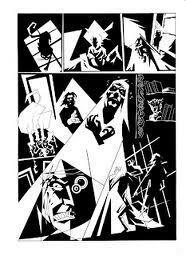 With a nice mix of writers and artists, Nevermore is an ever-changing experience from very graphic and stark images to those of a more painterly quality, and not a dud amongst them. For me, one of the highlights is ‘Edgar Allan Poe’s Biography’ by Laura Howell, which rounds up the end of the book – giving all the mysterious facts of Poe’s own life and death compressed into just two creative and informative pages. 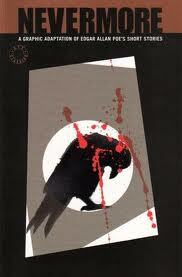 THE RAVEN adapted by Dan Whitehead and Stuart Tipples. Art by Stuart Tipples. THE PIT & THE PENDULUM adapted by Jamie Delano. Art by Steve Pugh. THE FACTS IN THE CASE OF MR VALDEMAR adapted by Jeremy Slater. Art by John McCrea. THE MURDERS IN THE RUE MORGUE adapted by Ian Edginton. Art by D’Israeli. THE FALL OF THE HOUSE OF USHER adapted by Dan Whitehead. Art by Shane Ian Oakley. THE BLACK CAT adapted by Leah Moore and John Reppion. THE OVAL PORTRAIT adapted by David Berner. Art by Natalie Sandells. THE TELL-TALE HEART adapted by Jeremy Slater. Art by Alice Duke. THE MASQUE OF THE RED DEATH adapted by Adam Prosser. Art by Erik Rangel. EDGAR ALLAN POE’S BIOGRAPHY art and script by Laura Howell. Highly recommended both to fans of Poe and collectors of fine Graphic Novels.